In the last decade, Sheehy and Marsden1 proposed that writer's cramp is a physical dystonic disorder, and classified the illness into simple and dystonic type, depending on whether or not the symptoms appear only during writing. The pathophysiology of writer's cramp has been under dispute.2 Writer's cramp may be a disorder of motor subroutines possibly retained by the "set-related" neurons in the motor cortices and their connections to the basal ganglia, i.e., the cortex-basal ganglia-thalamus-cortex motor loop.2 We report a patient with dystonic writer's cramp treated by successfully selective Vo-complex thalamotomy. The term Vo-complex refers to the combination of the ventralis oralis posterior nucleus (Vop) and ventralis oralis anterior nucleus (Voa) of the thalamus. Case report. In 1991, an 18-year-old woman student at a high school noticed that her right hand became stiff when she wrote in a tense atmosphere. To write, she had to hold the pen tightly with exaggerated finger grip. The severity of her writing disability gradually progressed, and about 2 years later she could not write with her right hand at all; she taught herself to write with her left hand. From the beginning of 1995, the muscle cramps affected other manual tasks, such as the ability to handle a pair of chopsticks or a cup and saucer, and to put on lipstick. She consulted with a neurologist and was diagnosed as having dystonic writer's cramp. Medical and family history were not contributory. At first, the muscle cramp was markedly improved by medication including trihexyphenidyl (6.0 mg/day) and clonazepam(1.5 mg/day); she discontinued trihexyphenidyl because of side effects. The beneficial effect of clonazepam also gradually decreased, and she was referred to our neurosurgic service and admitted on March 22, 1996. On admission, her physical and mental condition was normal. A brain MRI study revealed no abnormal findings and other laboratory investigations were normal. Neurologic examinations revealed that muscular strength and deep tendon reflexes were normal bilaterally. There were no definite cerebellar signs such as hypotonia, dysmetria, discomposition, or ataxia. Sensory examination was normal. During the treatment with clonazepam (0.5 mg/day) she could not write with her right hand at all (figure, A-a) and other manual tasks with the right upper limb were also markedly affected. When receiving a larger dose of clonazepam (1.5 mg/day), she could write some nonlegible words with her right hand, but only slowly and with much effort (figure, A-b); she held the pen very tightly with an exaggeration of the normal semiflexed posture of thumb, index, and other fingers. The writing became jerky and she stopped(figure, A-b). Consistent with detailed analysis on muscle activation in writer's cramp,3 the surface EMG while writing showed co-activation of the extensor (i.e., triceps) and flexor(i.e., biceps) muscles of the elbow, with the triceps muscle especially overactive (figure, B). Figure. (A) Examples of writing with the right hand. Preoperatively, she could not write at all while receiving clonazepam at a dose of 0.5 mg/day (a). However, she was able to write some non-legible letters slowly at a dose of 1.5 mg/day of the drug (b). Seven days after operation, while receiving clonazepam (1.5 mg/day), she could write normally(c). 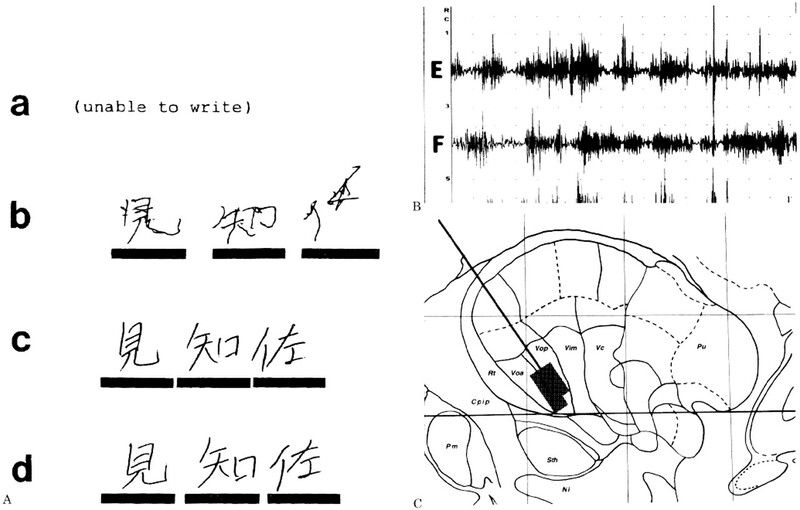 Six months after surgery while receiving clonazepam (0.5 mg/day), she could write legible letters without effort (d), as shown in c. (B) Surface EMG findings of the extensor (E; triceps) and flexor (F; biceps) muscles of the right elbow in writing. Note the co-activation of the extensor(E) (i.e., triceps) and flexor (F) (i.e., biceps) muscles of the elbow, with the triceps muscle being especially overactive. (C) Location and extension of the potential thalamotomy lesion made in a sagittal section of the Bailey-Schaltenbrand atlas (13.5 mm lateral from midline). Surgical thermolesion is indicated by the shaded area, which is located in the Vo-complex (Voa and Vop), and the needle trajectory by the solid line. On March 26, 1996, a left Vo-complex thalamotomy was carried out using local anesthesia with selective third ventriculography. We used Leksell's MRI-compatible stereotactic apparatus. The tentative target site determined at coordinate setting was 2 mm behind the midpoint of the line drawn between the anterior and posterior commissures and 13.5 mm lateral to and 1 mm dorsal to the line. Microelectrode recordings were taken at the thalamus target site and along the trajectory toward the target to determine the relative physiologic position of the probe. Electrical stimulation with a monopolar radiofrequency probe (1.0 mm diameter tip with 2.0 mm uninsulated length) was performed prior to lesioning to prevent injury to the internal capsule and other surrounding structures. After a test lesion at 42 °C for 60 seconds, a permanent anatomic lesion was made by heating the electrode tip to 70 °C for up to 60 seconds. The electrode was moved in 2-mm increments, and the lesioning process was repeated to increase the overall lesion size. The potential lesion made is depicted in figure C.
Her symptoms of dystonic writer's cramp were markedly alleviated by the thalamotomy. The writing test performed 7 days after surgery showed that she seemed to be able to write normally (figure, A-c) and her disabilities in performing other manual tasks with the right hand completely disappeared; she was receiving clonazepam (1.5 mg/day). Also of note is the operative complication of the central type of left facial paresis due to minimal thalamic hemorrhage, although it gradually diminished and she fully recovered within two months. The dose of clonazepam was tapered and she continued on 0.5 mg/day for three months after surgery. Although she complained of a slight deterioration in neatness and speed of writing, the improvement remained essentially unchanged upon examination six months after thalamotomy (figure, A-d). Discussion. The patient presented here initially manifested writing difficulty alone, but subsequently her symptoms were accompanied with difficulty in other motor tasks. Thus, her illness showed features of simple writer's cramp at the onset and later developed those of dystonic writer's cramp; classified as progressive writer's cramp, according to the description of Sheehy and Marsden.1 The effect of medication that included clonazepam on her symptoms was unsatisfactory, as reported for the majority of the patients with writer's cramp.1 Also, her illness was markedly disabling for her ordinary life including the vocation. Thus, we carried out the stereotaxy. Stereotactic thalamotomy was introduced as a treatment for dystonia by Cooper4 and it has been therapeutically used for many patients with the illness.4,5 However, little is known about the therapeutic effect of surgical intervention on writer's cramp(of a focal dystonia), while there are several detailed reports about stereotaxy for the primary writing tremor, that is sometimes also called writer's cramp and is now regarded as a specialized form of the essential tremor. Andrew et al.5 reported that among 55 cases of dystonia treated by stereotactic thalamotomy, one was a patient with dystonic writer's cramp who, after an initial improvement, relapsed six weeks later back to his preoperative state. From their description, the nucleus ventralis intermedius (Vim) and the nucleus ventralis caudalis internus and externus appear to have been used as the target sites for lesions in that patient. As shown in figure C, we located the thermolesion selectively in the Vo-complex in our patient and it successfully alleviated her writer's cramp. Since the Vo-complex receives major input from the basal ganglia output nuclei,6 in conjunction with the previous findings on hemidystonia,7 the present findings suggest that functional abnormality of the cortex-basal ganglia-thalamus-cortex motor loop may cause (dystonic) writer's cramp as well as other dystonias. In conclusion, we strongly suggest that patients with writer's cramp can be good candidates for surgical intervention (i.e., selective Vo-complex thalamotomy). Received December 16, 1996. Accepted in final form May 2, 1997. Sheehy MP, Marsden CD. Writers' cramp-a focal dystonia. Brain 1982;105:461-480. Kaji R, Shibasaki H, Kimura J. Writer's cramp: a disorder of motor subroutine? Ann Neurol 1995;38:837-838. Hughes M, McLellan DL. Increased co-activation of the upper limb muscles in writer's cramp. J Neurol Neurosurg Psychiatry 1985;48:782-787.
Cooper IS. Dystonia: surgical approaches to treatment and physiologic implications. In: Yahr MD, ed. The basal ganglia. New York: Raven Press, 1976:369-383. Andrew J, Fowler CJ, Harrison MJG. Stereotaxic thalamotomy in 55 cases of dystonia. Brain 1983;106:981-1000. Narabayashi H. Tremor: its generating mechanism and treatment. In: Vinken PJ, Bruyn GW, Klawans HL, eds. Handbook of clinical neurology. Vol. 5 (49). Amsterdam: Elsevier, 1986:597-607. Marsden CD, Obeso JA, Zarranz JJ, Lang AE. The anatomical basis of symptomatic hemidystonia. Brain 1985;108:463-483.